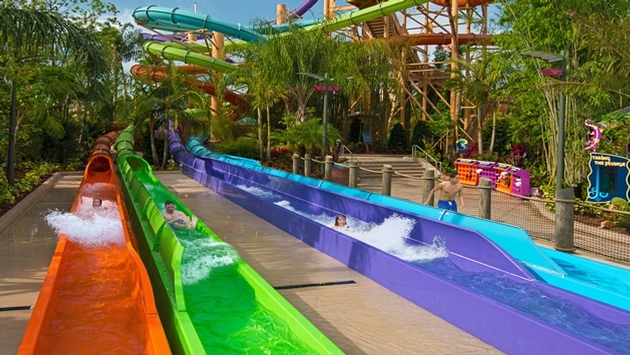 Ihu’s Breakaway Falls - the tallest, steepest and only multi-drop tower slide of its kind in Orlando – is now open at Aquatica, SeaWorld’s Waterpark. Riders climb 126 steps to the top of the eight-story tower (nearly 80 feet), stepping into one of three colorful breakaway boxes. As the door closes, riders cross their arms and give a thumbs up in preparation for their drop — they’ll never know when the floor beneath them will disappear! Facing each other, riders watch as their fellow riders fall. Adding to the anticipation is the sound of a heartbeat, which can be heard in the background while bracing for the drop. Once the floor disappears, riders drop 20-24 feet per second launching them into a spiraling speed slide culminating in a final splashdown. Riders who are not quite brave enough for the breakaway boxes can try the open slide. But don’t be fooled, this is not an ordinary slide; it’s the steepest of the four slides and many riders are calling it the most intense.